When the Boston Bruins hit the ice at Notre Dame Stadium to face off against the Chicago Blackhawks at the 2018 NHL Winter Classic they’ll take a step into the past, the 1930s to be specific. That’s because the team unveiled their brand new Winter Classic jerseys today and they pay homage to the team’s history, with classic stripes and the team’s original B logo. BOSTON - The Boston Bruins are nearly a century old. It is an organization steeped in rich tradition and history, having been home to some of hockey's all-time greats. And we're not just talking about its players. Through the decades, the Bruins have donned some iconic sweaters, from the early days of the roaming bear, to the evolution of the legendary Spoked-B, and even that bright gold "Pooh-Bear." Thus, it was not an easy task for Bruins president Cam Neely to find the right theme for Boston's sweaters at the upcoming 2019 Bridgestone NHL Winter Classic against the Chicago Blackhawks at Notre Dame Stadium. Ultimately, Neely, other members of the B's organization, and representatives from adidas settled on an homage to the 1930s and the days of legendary defenseman Eddie Shore. Similar to the sweaters from the 1932-36 seasons, the brown and gold uniform features heritage materials and striping. Highlighting the throwback look, the crest features the classic "B" logo from the team's home and away sweaters during those years, created with a carpet-like, two-layer felt application. To complete the theme, the player names and numbers also feature two-layer felt materials. "I think it's really, really beautiful," said Bruins captain Zdeno Chara, who has played in both previous Winter Classics that Boston has participated in. "I had a chance to see it and have all the little details explained to me. I think it's cool how they included all the important pieces of the history and the identity of this team. I think it's really special. Very simple, but very unique." One of the most unique parts of the sweater is on the inside of the collar, where the years of the Bruins' Stanley Cup championships are emblazoned on shamrocks, in a nod to the Fighting Irish. "I wanted to pay a little homage to Notre Dame and the shamrock that is so famous there," said Neely. "Obviously it's on the Winter Classic patch, but we put the years of the Stanley Cups in the collar just to give it a little bit more flavor…it ties in Notre Dame a little bit with the success of the franchise and the six Stanley Cups." For the 2010 Winter Classic against the Philadelphia Flyers at Fenway Park - the Bruins' first outdoor game - Boston donned a gold jersey with a rounded Spoked-B, reminiscent of the inaugural Spoked-B from the 1948-49 season. 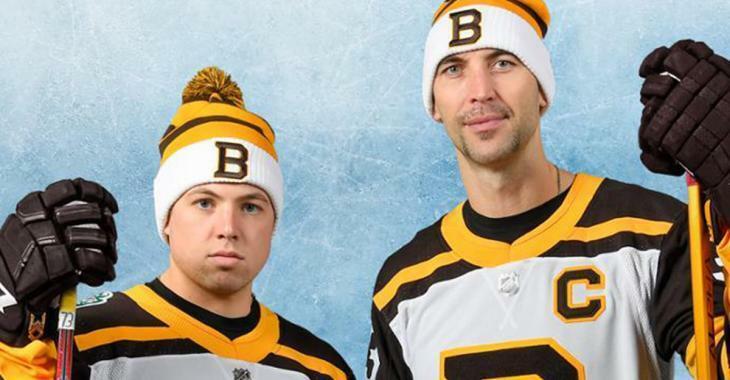 And in 2016, for Boston's second Winter Classic experience against the rival Montreal Canadiens at Gillette Stadium, the black sweater was a throwback to 1924 - the Bruins' first year in the NHL - with "Boston" arched over an illustrated bear and Bruins. "It's hard to really pick one," Chara said when asked for his favorite. "I think this one is really, really nice because it's a little bit brighter - it's white - than the previous ones. But I think they all have something special with them and it's such a unique thing to play the Winter Classic. "You have to enjoy it. It's just a special feeling to wear the Winter Classic jersey because it's so much history, so much they want to include in that one game and make part of the whole unity of Boston Bruins fans and heritage and history." Fans can purchase the 2019 Bridgestone NHL Winter Classic jersey at the Proshop on Level 2 of TD Garden, or by calling 617.742.0202 or toll free 877.527.8467during Proshop hours, Monday - Saturday, 10 a.m. - 5 p.m. or Sunday, 11 a.m. - 5 p.m., or by emailing ProShop@BostonBruins.com.